These felt flowers are bright and colorful. You can make lots of them while watching TV or just a few at a time. 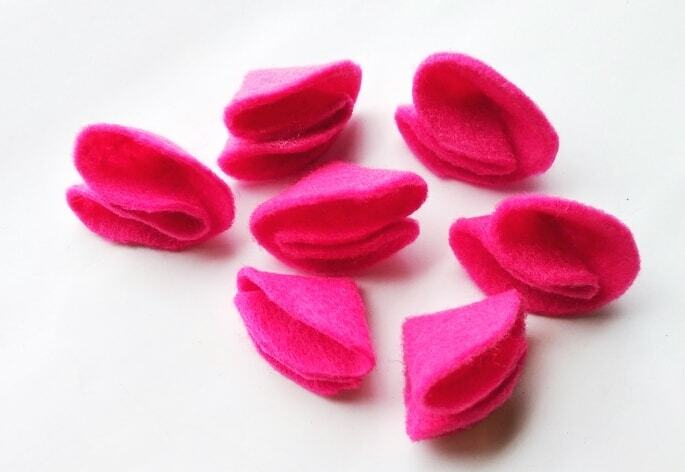 These ruffled felt flowers are perfect for both crafts and fashion. 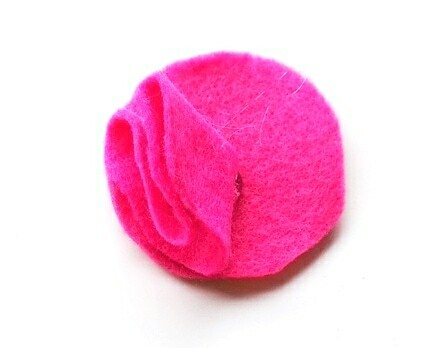 Think of making lots of these ruffled felt flowers in multiple colors to decorate a wreath. Or create a couple no sew felt flowers to attach to hair clips (both adult’s and children’s), headbands, or create a brooch. Because felt costs so little (about .50 cents a piece, especially when you buy multi-colored packs like this one), you can try this easy craft with very little investment. Or just use scraps of felt that you already have on hand to create something new. 1. Cut out 8 equal circular pieces of felt. There is no standard size of circle that you must have. Make them as large or as small as you’d like. We suggest using a glass or cookie cutter (or any other circular item) to trace to make equal size circles. 2. 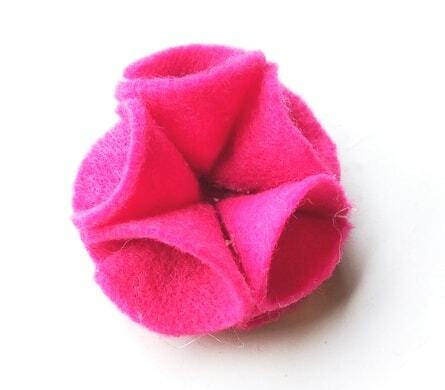 Take one circle of the felt and fold it in four. Do this by folding the circle in half, then fold it in half again. 3. To keep the felt piece looking this way, you’ll want to glue it together using either hot glue or craft glue. Glue the folds together to keep it secure. Hold the felt together for at least 15 seconds to make sure the glue dries. 4. 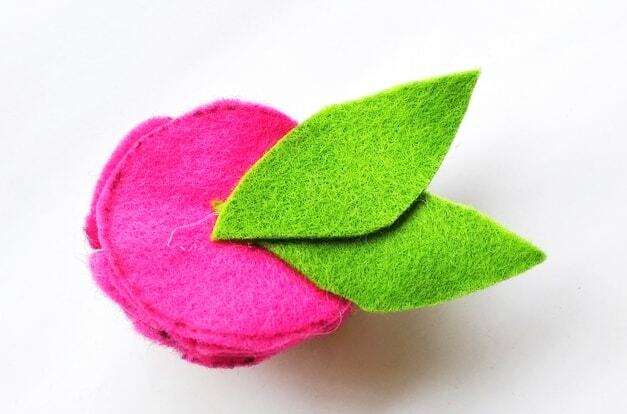 Create 7 folded pieces of felt in total. Leave one of the felt circles unfolded. 5. On the remaining flat felt circle, glue a folded piece on top. 6. 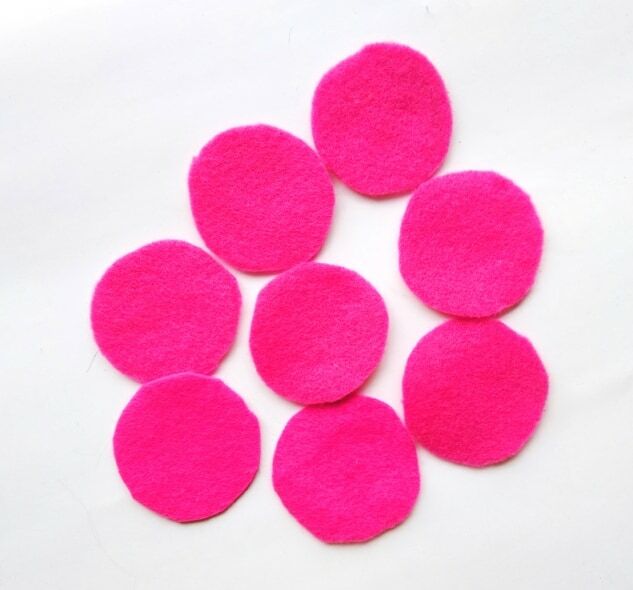 Glue a total of 5 felt pieces onto the top of the flat felt circle. They will be tight together, but that will create the ruffled felt flower look. Be sure to allow the glue to completely dry. 7. In the middle of the base, now insert and glue the remaining two felt pieces. 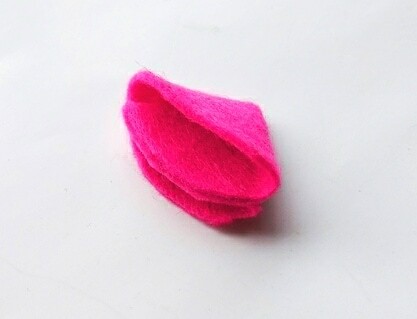 You will want the folds to face upwards, so that the entire ruffled felt flower looks full. 8. 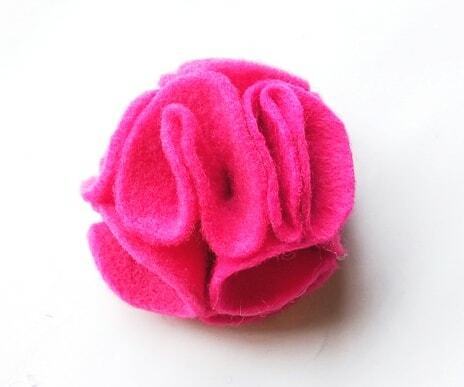 Add leaves to the ruffled felt flower if you would like. To do so, cut two leaf shapes from green felt. Glue them onto the bottom of the flower base. 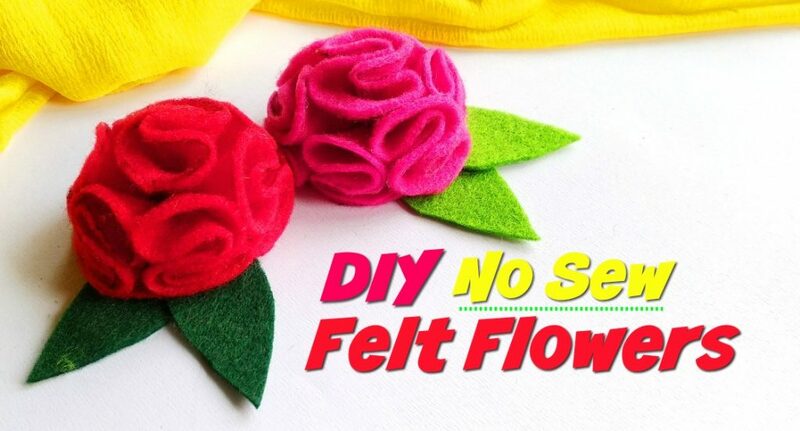 Use these easy DIY ruffled felt flowers all year long for flowers that never die! Share how to make these easy no sew felt flowers on Pinterest or your favorite social media account. They are so easy to make, your friends will want to do it, too!